Carey’s Daphne Kirkland soars to a fifth-place 13-3.5 long jump during Thursday’s Carey Invitational track and field meet. Courtesy photo by John Peck. The Carey High School boys' track and field team is doing things a little differently this spring in navigating its way through a very competitive Northside and Southside Conference 1A Division 2 league. Carey, going without its traditional distance running threat, is using depth to pile up points in the field events. That strategy paid off Thursday, April 21 at the 10-school Carey Invitational on the Derrick Parke Memorial Field oval. The Panthers (54.5 points field) won the boys' meet with 131.5 points, about 35 more than second-place Camas County of Fairfield (97). And Carey dominated despite winning gold in only three events—two relays and the intermediate hurdles. In those 300-meter intermediates, Carey senior Joe Laidlaw and Murtaugh junior Humberto Pacheco waged perhaps the day's most competitive race. They are two of the top three 1A hurdlers this season in the entire Gem State and they showed it Thursday. Laidlaw won in 42.80 seconds, just ahead of Pacheco's 42.90. Laidlaw also ran the third leg in Carey's winning 4x200m relay and anchored the Panther 4x400m relay winner with Shane Bingham, Jack Cenarrusa and Jacy Baird. Those were Carey's gold medals on the day. Baird was second in the 400m dash, and junior Charlie Rivera had a good day with second places in long jump and triple jump. Outside of the distances, Carey displayed good balance (19 sprints, 23 hurdles, 29 relays). Outstanding boy was Castleford sprinter Kale Weekes, who won the 100m, 200m and 400m. Camas County's Bryan John dominated the 1600m and 3200m distances, winning those races by 4.1 and 12.1 seconds. Certainly the top girl Thursday was Camas junior Katelyn Peterson, a 40-point performer by winning the 100m and 200m dashes plus high jump and triple jump. 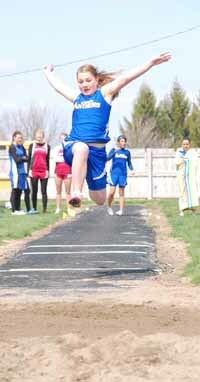 She is the reigning state triple jump champ. Peterson's 40 points in individual events plus Carlie Strom's 300m intermediate hurdles win lifted the Mushers to a narrow 10-point triumph over Carey in the team standings, by a 128.5 to 118.5 margin. The Musher girls landed 60 points in the field, 26 hurdles and 28.5 in sprints. Carey (44 field, 28 relays) may have overcome the Mushers in the standings, but the Panthers were disqualified in one of their best events, the sprint medley relay. Carey's girls won two other relays, 4x100m and 4x200m, and got a first place from sophomore Jaide Parke in the 3200m distance run. Junior Micaela Adamson followed behind Camas' Peterson with seconds in the 200m and triple jump. Next: Carey and Camas County travel to today's weekly Northside/Southside gathering at the ISDB oval in Gooding. Next Panther home meet is the Northside Championships Wednesday, May 4 at 2 p.m. Teams: 1—Carey 131.5 points (19 sprints, 23 hurdles, 6 distances, 29 relays, 54.5 field). 2—Camas County 97 (0 sprints, 1 hurdles, 37 distances, 21 relays, 38 field). 3—Castleford 86.5. 4—Hagerman 78.5. 5—Murtaugh 74.5. 6—Hansen 47.5. 7—Lighthouse Christian 41.5. 8—Shoshone 38.5. 9—Dietrich 30.5. 10—Richfield 25. 100m: 1—Kale Weekes (Castle) 11.50. 4 (tie)—Joe Laidlaw (C) 12.10. 7 (tie)—Charlie Rivera (C) 12.20. 200m: 1—Kale Weekes (Castle) 24.70. 5—Lynn Mecham (C) 25.51. 7—Christian Zarate (C) 26.40. 400m: 1—Kale Weekes (Castle) 53.70. 2—Jacy Baird (C) 54.40. 800m: 1—Troy Baynes (Murt) 2:19.90. 2—Davey Knowlton (CC) 2:24.80. 4—Caleb Cenarrusa (C) 2:28.50. 8—Fidel Ruiz (C) 2:36.70. 1600m: 1—Bryan John (CC) 5:10.80. 5—Airik Donohoe (CC) 5:32.50. 3200m: 1—Bryan John (CC) 11:09.20. 4—Airik Donohoe (CC) 11:35.60. 110m high hurdles: 1—Humberto Pacheco (Murt) 16.70. 4—Dillon Cenarrusa (C) 18.30. 6—Shane Bingham (C) 18.90. 5—Tori Alvarez (C) 19.20. 300m intermediate hurdles: 1—Joe Laidlaw (C) 42.80. 2—Humberto Pacheco (Murt) 42.90. 6—Tori Alvarez (C) 48.60. 8—Carlos Robles (CC) 50.60. High jump: 1—Andrew Simon (CC) 5-10. 4 (tie)—Charlie Rivera (C) 5-4 and Jack Cenarrusa (C) 5-4. 7—Caleb Cenarrusa (C) 5-2. Long jump: 1—Andy Levdansky (Hager) 18-8.75. 2—Charlie Rivera (C) 18-7. 4—Jacy Baird (C) 18-3.25. 6—Brandyn Williams (CC) 17-7. 7 (tie)—Luis Garcia (C) 17-5.5. Triple jump: 1—Jayme Johnson (Hansen) 39-2. 2—Charlie Rivera (C) 38-8.25. 3—Caleb Cenarrusa (C) 38-8. 4—Carlos Robles (CC) 38-7.75. 7—Austin Walker (CC) 37-1. 8—Brandyn Williams (CC) 36-11. Shotput: 1—Kade Kress (Hager) 39-0. 3—Jordan Robles (CC) 37-8. 5—Francisco Gamino (C) 37-2.5. 8—Blair Peck (C) 35-6. Discus: 1—Jordan Robles (CC) 132-0. 3—Blair Peck (C) 108-10. 5—Francisco Gamino (C) 102-4. 8—Dillon Miller (CC) 95-0. 4x100m relay: 1—Hagerman 47.40. 3—Camas County (Andrew Simon, George Simon, Brandyn Williams, Carlos Robles) 49.10. 5—Carey (Tori Alvarez, Lynn Mecham, Luis Garcia, Christian Zarate) 52.50. 4x200m relay: 1—Carey (Jack Cenarrusa, Lynn Mecham, Joe Laidlaw, Jacy Baird) 1:37.40. Sprint medley relay (200, 200, 400, 800): 1—Castleford 4:01.40. 2—Camas County (Andrew Simon, George Simon, Austin Walker, Davey Knowlton) 4:14.10. 4—Carey (Jack Cenarrusa, Lynn Mecham, Shane Bingham, Glen Andrews) 4:23.30. 4x400m relay: 1—Carey (Shane Bingham, Jack Cenarrusa, Jacy Baird, Joe Laidlaw) 3:48.40. 3—Camas County (Andrew Simon, George Simon, Cody Lane, Davey Knowlton) 3:55.70. Teams: 1—Camas County 128.5 (28.5 sprints, 26 hurdles, 0 distances, 14 relays, 60 field). 2—Carey 118.5 points (21.5 sprints, 4 hurdles, 21 distances, 28 relays, 44 field). 3—Castleford 95. 4—Shoshone 66.5. 5—Hagerman 60.5. 6—Richfield 52. 7—Dietrich 33. 8—Bliss 32.5. 9—Hansen 29.5. 10—Murtaugh 10. 100m: 1—Katelyn Peterson (CC) 13.40. 4 (tie)—Angelica Zarate (C) 14.00. 6—Daphne Kirkland (C) 14.20. 7—Arriana Nielson (C) 14.50. 8 (tie)—Larissa Stewart (CC) 14.60. 200m: 1—Katelyn Peterson (CC) 28.90. 2—Micaela Adamson (C) 29.00. 5—Arriana Nielson (C) 31.40. 6—Larissa Stewart (CC) 31.60. 7—Stephanie Moore (CC) 32.00. 400m: 1—Larissa Knight (Hager) 1:07.80. 6—Larissa Stewart (CC) 1:12.80. 800m: 1—Abby Burk (Bliss) 2:47.80. 6—Morgan Parke (C) 3:26.80. 1600m: 1—Abby Burk (Bliss) 6:08.70. 2—Jaide Parke (C) 6:42.40. 3200m: 1—Jaide Parke (C) 13:52.50. 100m high hurdles: 1—Moriah Dill (Diet) 18.50. 2—Carlie Strom (CC) 18.70. 4—Brittani Hulme (CC) 20.40. 5—Jessica Richardson (C) 20.80. 300m intermediate hurdles: 1—Carlie Strom (CC) 56.20. 6—Brittani Hulme (CC) 1:01.70. High jump: 1—Katelyn Peterson (CC) 5-6. 2—Brittani Hulme (CC) 4-4. 3—Jaide Parke (C) 4-2. 4—Carlie Strom (CC) 4-2. 5—Jessica Richardson (C) 4-2. Long jump: 1—Jesica Lowe (Sho) 14-4.5. 3—Lilly Rivera (C) 13-5.25. 4—Erika Zarate (C) 13-4. 5—Daphne Kirkland (C) 13-3.5. 6—Stephanie Moore (CC) 12-11.25. Triple jump: 1—Katelyn Peterson (CC) 34-0.5. 2—Micaela Adamson (C) 31-9. 4—Stephanie Moore (CC) 29-9.5. Shotput: 1—Keegan Cenarrusa (Rich) 31-8. 2—Jessica Lanier (CC) 29-10.75. 5—Taylor Gorringe (CC) 28-11.5. 7—Lorene Andrews (C) 26-0.5. Discus: 1—Keegan Cenarrusa (Rich) 95-9. 2—Lorene Andrews (C) 91-4. 5—Taylor Gorringe (CC) 77-4. 6—Jessica Lanier (CC) 76-7. 8—McKayla Mecham (C) 69-5. 4x100m relay: 1—Carey (Daphne Kirkland, McKayla Mecham, Arriana Nielson, Angelica Zarate) 55.90. 2—Camas County (Stephanie Moore, Brittani Hulme, Carlie Strom, Larissa Stewart) 57.60. 4x200m relay: 1—Carey (Angelica Zarate, McKayla Mecham, Lilly Rivera, Micaela Adamson) 1:59.50. 6—Camas County (Jamie Wise, Sierra Sabin, Geovanna Gonzalez, Taylor Gorringe) 2:22.50. Sprint medley relay (100, 100, 200, 400): 1—Castleford 2:06.60. 6—Camas County (Geovanna Gonzalez, Sierra Sabin, Jamie Wise, Cheylynn Hansen) 2:34.00. 4x400m relay: 1—Hagerman 5:10.60. 2—Carey (Erika Zarate, Charmaine Kirkland, Jessica Richardson, Lilly Rivera) 5:21.10.